Amazon.com is no longer the epitome of online customer service. They allow our personal information to be accessable by search engines and blame the likes of Google when these details are published rather than owning up to their own responsibilities. This person (not me) doesn't know that her address has been made available to anyone who can use google. Her trust in amazon is being betrayed, she may get more than she "wished" for. When I contacted Amazon asking for an explanation, their reply showed that they were clueless, and more concerned with ducking responsibility than understanding their problem and putting it right. Paula from Customer Service was of the mistaken impression that Google to blame for providing Amazon's customer information. 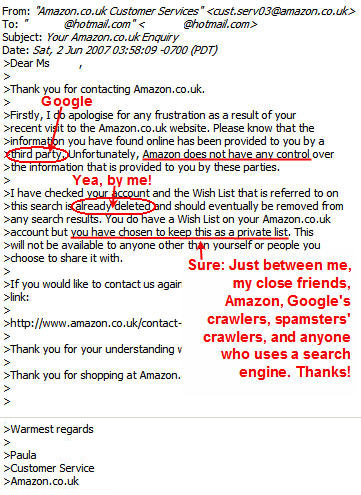 Hmm, and who gave Google access to Amazon's customer's info? That would be Amazon! 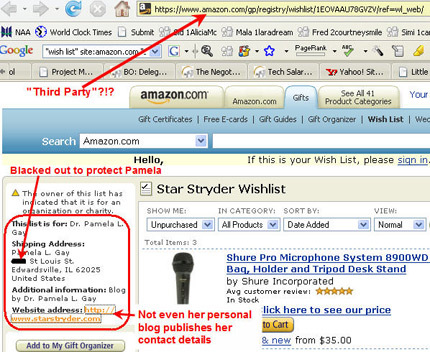 Amazon promise not to share personally identifiable information with third party websites. I replied to Laura from Amazon, asking her to escalate the issue. She sent a copy-paste reply, and nothing since. Am I the only one who feels Amazon have broken their promise and committed a huge blunder and breach of our trust in them? Being an online company, shouldn't we expect a more intelligent and competent response from Amazon? Aside from not using Amazon's wishlist, what should we do about this? "This is definitely an Amazon issue and not a Google issue. You can control what they crawl and what is sensitive data. Stop looking for excuses and fix the problem. Thanks for the information from your friends @ http://www.askTheAdmin.com"
"Amazon: We put you there. We don't expect much in return. Decent customer services. Treating our concerns seriously. Make no mistake - copy-paste spamming us is disrespecting us, big time. We are the geeks who influence folk to use your service. We persuade technophobes that it's "ok" to shop with you. When we alert you to a problem, pay attention. It's easy enough to switch to your competition."